In the words of President Obama, “More droughts and floods and wildfires are not a joke. They’re a threat to our children’s future.” Indeed, it is not a joke that driven by this summer’s drought in the U.S. and Eastern Europe, global food prices already sky-rocketed 10% from June to July, including record-high prices for corn and soybeans. Although wildlife aren’t bothered by high food prices, they are just as much affected as humans—if not more—by the climate change driven heat waves, severe droughts and widespread wildfires of this ruined summer. After all, wildlife don’t buy food at the grocery store. The extreme weather has unleashed a plague of black bear raids across the country. Black bears are crashing bars, stepping up to the counter at candy stores, cleaning out food pantries and helping themselves to farmer’s crops. 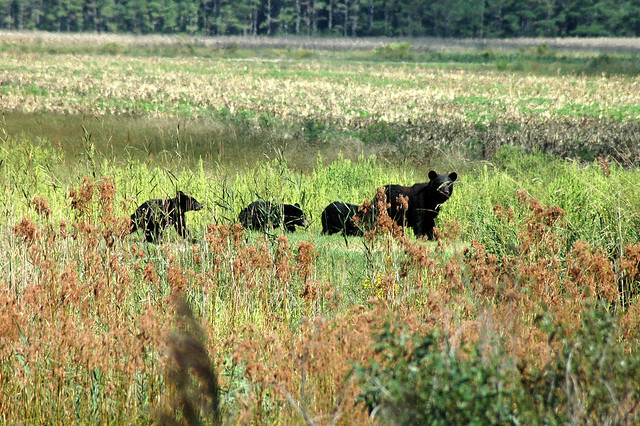 A black bear leading her cubs. USFWS photo. But who can blame them? They’re staring climate change in the face. The severe drought has devastated their normal wild food sources: acorns, berries and forbs have shriveled up in the extreme heat and drought. As if potential starvation wasn’t a big enough challenge, bears wandering into stores and walking down Main Street are at much greater peril of death than they are running wild in the woods. The extreme heat and drought, which has broken the record temperatures set during the infamous Dust Bowl in the 1930s, are harming other wildlife as well. Elk and deer are facing severe food shortages. In Utah, the number of hunting permits has been increased to reduce game populations before the long winter. The alternative is starvation. Streams as warm as bath water have caused massive fish kills in the Midwest. Moose just can’t take the heat…in recent years their populations in Minnesota have crashed. As reported by The Wall Street Journal, the record low ice cover in the Arctic and the record high ice melt in Greenland aren’t coincidental and are indeed associated with carbon emissions. Our nation’s leaders—the President and Congress—must take immediate and meaningful action to reduce our carbon emissions. Wildlife must be safeguarded from climate change. The National Wildlife Federation has been working hard to reduce carbon emissions and safeguard wildlife, but we can’t do it without your help. Help ensure the presidential candidates debate their plans to address climate change before the Nov. 6th election.